No sooner had the news hit France that the case against Dominique Strauss-Kahn could be close to collapsing, than his Socialist Party colleagues were already suggesting the former presidential hopeful could make a political comeback. 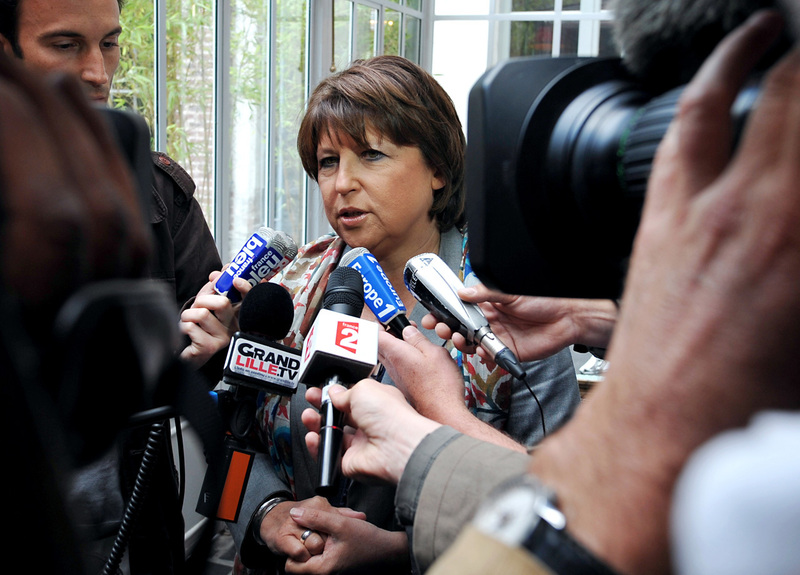 Party leader Martine Aubry said she hoped today's court hearing would finally end DSK's "nightmare." His ally, Socialist deputy Jean-Marie Le Guen, said Strauss-Kahn could be "a key player" in the presidential campaign. Former prime minister Lionel Jospin called the news "a thunderbolt." Party colleague Michele Sabban said that the Socialists should suspend the presidential primary calendar because of the new developments. The deadline for candidates for primaries is July 13. Just six weeks ago, before the accusations of sexual assault, the former International Monetary Fund leader was considered the Socialists' best chance of defeating incumbent president Nicolas Sarkozy in next year's elections. But the case against him - and subsequent revelations about his sexual habits and attitudes to women - changed all that. Now the situation has changed yet again. On Friday a judge in New York released Strauss-Kahn on his own recognizance without bail, after the Manhattan District Attorney's office uncovered serious questions about the credibility of a hotel housekeeper who accused Strauss-Kahn of sexual assault. When Strauss-Kahn was first incarcerated, the Socialists were forced to rethink their strategy. Just three days ago, party leader Martine Aubry (who had agreed to stand aside in favor of Strauss-Kahn) finally declared herself a candidate for the October primaries. Today, she was careful to stress that she was speaking "as a friend of Dominique Strauss-Kahn" when she welcomed the news of the new hearing. "I hope with all my heart that the American courts will be able to establish the full truth today and end this nightmare for Dominique," she said. Jack Lang, who has served as both Culture and Education Minister, suggested Strauss-Kahn still has a role to play. "We can't ignore a candidate of his caliber," he said. His political opponents have been more circumspect. President Sarkozy has maintained his silence throughout, and today was no different. Prime Minister Francois Fillon said only that people should wait until the hearing before commenting. National Front leader Marine Le Pen, who has been scoring high in opinion polls, was more direct. "I don't see how he can come back as a candidate in the Socialist primaries, no matter what happens (in court)," she said. In the weeks following his arrest, DSK's reputation as a ladies' man was widely discussed. There were claims that his advances were not always welcome, and some female journalists revealed they refused to interview him alone. The case led to much public debate about sexism in France and the way French media traditionally reveal little of the sexual rumors surrounding politicians. Now that those issues have been placed firmly in the spotlight, many believe it's unlikely the French public would be happy with a president whose reputation has been so publicly tarnished. Unless the New York court finds the charges against him were completely baseless, it's likely Strauss-Kahn's presidential ambitions, and possibly his political career, are indeed over.